At first, he couldn’t give them away. Selling at more than double the price of other jellybeans, people laughed at him. Determined, he called up the Associated Press and lied through his teeth. He told the editor that he had the only jellybean store in the world and that the store was doing gangbusters. He arranged for a reporter to visit, and then called all of his friends into action. They posed as customers and pretended to come and go from the store, buying and raving about the Jelly Belly beans. It worked, and overnight Jelly Belly was a success. 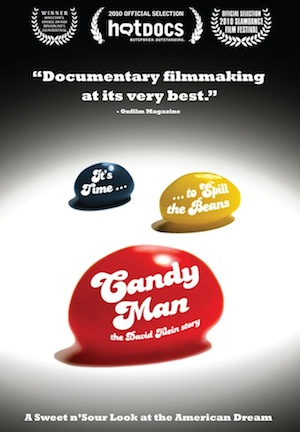 The colorful beans became a pop culture phenomenon, changed the candy industry forever and were personally endorsed by President Ronald Reagan. However, David’s eccentric personality and peculiar sense of business led him to lose Jelly Belly just as it was about to explode and grow into a billion dollar enterprise. If you’re interested in learning more about the guy responsible for some of life’s yummiest moments, you’ll enjoy this movie. The DVD, which also features Weird Al Yankovic, is available at Amazon. I have two copies of this DVD to giveaway. And since you can’t watch a movie about Jelly Belly without eating some, both DVDs will come with one pound of Jelly Belly jellybeans. The full list of Jelly Belly flavors is here. Canâ€™t See the Form? : If you are reading this via Facebook or RSS or on an iPad, please visit the blog to enter. If you are at the blog, trying hitting the â€œrefreshâ€ button in your browser.